The Wolverine F2D Super has been replaced by the Wolverine F2D Mighty. As long as you have more than a handful of images to convert, the film to digital converter is able to save you a large amount of money. One of the converters out there that you need to look into and consider is the Wolverine 4-in-1 Film to Digital Converter. If you are old enough to remember using film cameras on a regular basis, you probably have boxes upon boxes of old pictures and film strips sitting in boxes somewhere in your house. This is an art form that the new generation simply never had any sort of experience with. While digital cameras are all nice and easy, there is something about the feel of film and the way it looks after it is captured that just can’t be replicated (especially with any of those free cell phone applications). However, this does leave you with those large boxes of film that are quickly deteriorating. You might want to share these images with your friends and family members, plus ensure the film is able to remain with you for years to come. In order to do this, you need to convert the analog film to a digital format. Now, you can take all of your film strips into a local developer, but these locations are going to charge by the image, which in turn can cost you hundreds, if not thousands upon thousands of dollars. There really is no reason to do something like that when you can use a film to digital converter device. The first feature to look into with the Wolverine Film to Digital Converter is the kind of film it is how it works. You have a few ways of saving the files. The first is you can directly connect it to any Windows or Mac computer. This way, if you are performing the conversion at home, you don’t need to transfer files over and over, which makes it easier and more time friendly. You simply connect the USB cable and scan the images over, just like you would any other computer scanner. Of course, it is going to take some time scanning one slide and image on film at a time, but it is well worth your effort to save the important memories that you have captured. Of course, there are going to be times where you don’t have your computer around. You might need to scan the images at your parents house or at the office and you don’t have the computer present that you want to use. The Wolverine Film to Digital Converter comes with both an internal memory and an SD card slot. The internal memory really isn’t that large, so you want to avoid that. However, memory cards, which are the same cards you would use in a digital camera, allows you to save hundreds upon hundreds of images per card, and then you can transfer the files to your computer back home.This Wolverine Converter really makes this easy on you and most of the Amazon reviewers enjoy this feature of the device, as almost all of the positive reviewers said how much they enjoy being able to scan the images right to their SD cards (out of the 105 reviews, 84 of them are at least four stars or higher). The second element of the Wolverine film scanner that needs to be looked at are the formats that the device scans. It isn’t just a scanner for your traditional 35mm camera. 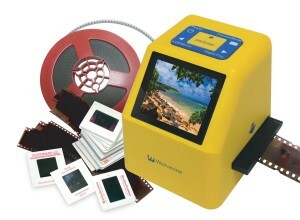 It can also convert 110, 126KPK and Super 8 slides and the negatives over to a digital format. If you do have a negative that you are not really sure what to do with, there are plenty of programs available to purchase that convert the negative into a positive image. You might even be able to find some free demo programs online that allows you to convert the negatives for free before the set time frame runs out. This way, you can see the image in all of its glory. The only real downside with the Wolverine Digital Converter is that it does not support 16mm film. While you probably did not have a 16mm camera, as these were more of a professional grade of camera and far more expensive, it would be nice to offer this particular feature, if you ever needed it. Outside of this issue, the Wolverine is able to provide service for all of the other major film stocks that you probably used. Lastly, probably the most important feature is the megapixel quality of the images you scan in. 20MP is very desirable, but it isn’t as high as you might think. Film images have a much higher resolution density than what a digital camera has. So while 20 MP is nice, you might actually lose just a bit of the full quality of your 35mm print. You won’t be able to see it on your computer screen and chances are you will never notice it, unless you intended to blow up the image. If you did, than you would start to notice the difference in a blown up 20MP image and that of a 35mm image, as the 35mm would retain its quality better, but there has to be a digital rate somewhere, and 20MP is a nice place. For example, 16mm movie film actually has about the same resolution as an HD movie today. This means a 35mm film would have a 2K resolution, or twice that of traditional HD. However, none of the reviewers had any real issue with the quality of the scanned image and found it to be incredibly easy to use. So, when you want to save your film based material and convert it over to a digital format, the Wolverine 4-in-1 Film to Digital Converter is one of the very best options around.